Resistance to commonly used antimicrobials is a growing concern in both human and veterinary medicine. Understanding the temporal changes in the burden of the problem and identifying its determinants is important for guiding control efforts. 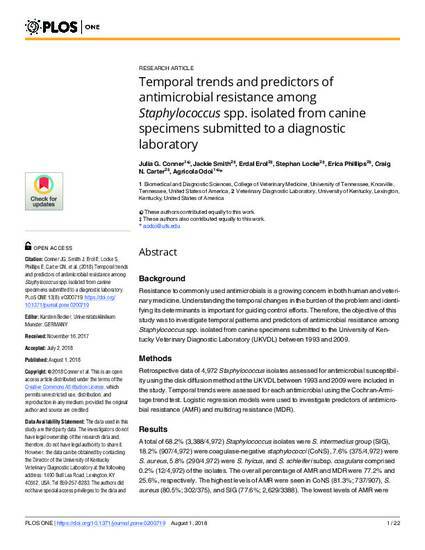 Therefore, the objective of this study was to investigate temporal patterns and predictors of antimicrobial resistance among Staphylococcus spp. isolated from canine specimens submitted to the University of Kentucky Veterinary Diagnostic Laboratory (UKVDL) between 1993 and 2009. Retrospective data of 4,972 Staphylococcus isolates assessed for antimicrobial susceptibility using the disk diffusion method at the UKVDL between 1993 and 2009 were included in the study. Temporal trends were assessed for each antimicrobial using the Cochran-Armitage trend test. Logistic regression models were used to investigate predictors of antimicrobial resistance (AMR) and multidrug resistance (MDR). A total of 68.2% (3,388/4,972) Staphylococcus isolates were S. intermediusgroup (SIG), 18.2% (907/4,972) were coagulase-negative staphylococci(CoNS), 7.6% (375/4,972) were S. aureus, 5.8% (290/4,972) were S. hyicus, and S. schleiferi subsp. coagulans comprised 0.2% (12/4,972) of the isolates. The overall percentage of AMR and MDR were 77.2% and 25.6%, respectively. The highest levels of AMR were seen in CoNS (81.3%; 737/907), S. aureus (80.5%; 302/375), and SIG (77.6%; 2,629/3388). The lowest levels of AMR were observed in S. hyicus (57.9%; 168/290) and S. schleiferi subsp. coagulans (33.3%; 4/12). Overall, AMR and MDR showed significant (p<0.001) decreasing temporal trends. Significant temporal trends (both increasing and decreasing) were observed among 12 of the 16 antimicrobials covering 6 of the 9 drug classes assessed. Thus, significant increasing temporal trends in resistance were observed to β-lactams (p<0.001) (oxacillin, amoxicillin-clavulanate, cephalothin, and penicillin (p = 0.024)), aminoglycosides (p<0.001) (gentamicin, and neomycin), bacitracin (p<0.001), and enrofloxacin (p<0.001). In contrast, sulfonamide (p<0.001) (sulfadiazin) and tetracycline (p = 0.010) resistant isolates showed significant decreasing temporal trends in AMR. Staphylococcus spp., geographic region, and specimen source were significant predictors of both AMR and MDR. Although not unexpected nor alarming, the high levels of AMR to a number of antimicrobial agents and the increasing temporal trends are concerning. Therefore, continued monitoring of AMR among Staphylococcus spp. is warranted. Future studies will need to identify local factors responsible for the observed geographic differences in risk of both AMR and MDR.